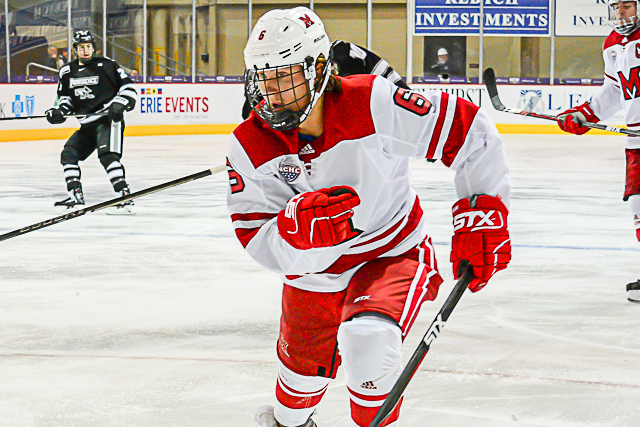 OXFORD, Ohio – The last series Miami played against Minnesota-Duluth, the RedHawks were shut out on the road, 4-0 in the opener and 3-0 in the finale. The No. 5 Bulldogs repeated that feat this weekend by identical scores. After beating MU 4-0 on Friday, UMD reeled off its fourth straight shutout vs. Miami, 3-0 at Cady Arena on Saturday. The RedHawks have not scored against UMD in 257:08. 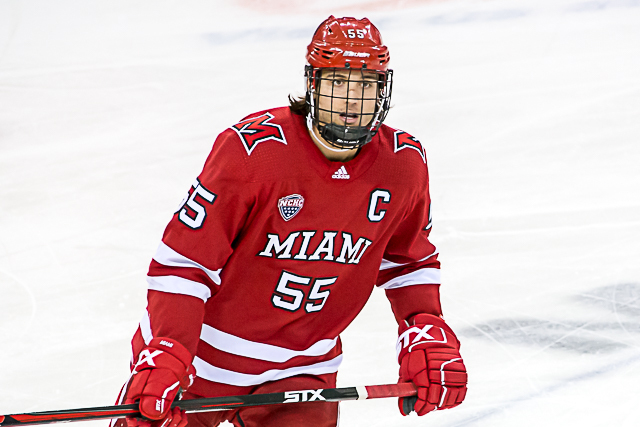 Miami (9-11-4) played without both captains – Josh Melnick and Grant Hutton – and starting goalie Ryan Larkin watched the game from the bench. The RedHawks’ winless streak has reached 10 games, with their last win coming over two months ago. RECAP: Minnesota-Duluth (14-6-2) opened the scoring when Scott Perunovich tipped home a wrister from the blue line by Nick Swaney on the power play at the 17-minute mark of the first period. 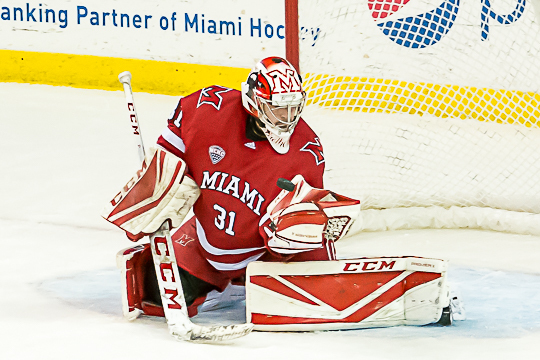 Midway through the second frame, Miami was on a two-man advantage when the RedHawks’ Jonathan Gruden had a shot blocked and UMD’s Justin Richards went in for a breakaway but was hooked from behind by Derek Daschke, resulting in a penalty shot as one skater returned to the ice. Richards scored, going backhand to the stick side to make it 2-0. The Bulldogs sealed it 4:13 into the third period when Noah Cates stripped Casey Gilling, and the loose puck ended up on the stick of Swaney, who was all alone at the top of the crease for a slam-dunk goal. STATS: Overall, Miami’s scoreless drought has reached 141:26. The RedHawks set a school record by being blanked for over 240 minutes in 2017-18, which included its shutout weekend at Duluth. — The RedHawks finished with the same faceoff percentage both nights (.333). They went 18-36 in the circle in this game after struggled to a 20-40 mark on Friday. — Miami slipped to 1-8-1 in January games dating back to last season and is 4-16-3 overall in the second half the past two campaigns. — For over two months, the RedHawks have been in pursuit of win No. 10. They are 1-19-6 since 2016-17 going after that elusive 10th victory. — MU dropped to 1-13-1 in its last 15 meetings with the Bulldogs. THOUGHTS: Like Friday, Miami was buzzing in the first period despite its lack of star power, but once again a late first-period goal by Minnesota-Duluth completely deflated the RedHawks. The two-man advantage-turned-shorthanded-rush-turned-penalty-shot also represented a major momentum swing in the game, since it was an excellent opportunity for Miami to tie the score that went horribly, horribly wrong. From there, it was obvious that Bulldogs goalie Hunter Shepard wasn’t going to give up a pair of late goals, as he was outstanding in shutting Miami out for the fourth straight time. — Hutton was given a game misconduct and not a disqualification on Friday, so the decision to sit him was on Miami’s coaching staff. It was a bad penalty for sure and I have no problem scratching him for a game, especially with the team mired in a deep slump. Hutton is an exceptional talent and a wonderful young man, but as a senior he hasn’t taken that step forward that we’ve seen elite NHLers-to-be often take their final season. One pro scout said he hasn’t seen an urgency in his game this year. Sometimes even elite players need a wake-up call, and hopefully a night in the stands will rejuvenate Hutton. No Hutton, no Melnick and no Larkin against the No. 5 team was a tall order for the RedHawks, but sometimes a shake-up is needed when a team is struggling. — Melnick is battling a lower-body injury and Larkin was pulled after allowing four goals on 22 shots on Friday. Hopefully Melnick will return next weekend. — The current review process has to stop. It’s ruining games. Everyone wants calls to be correct. But there has to be a limit. A UMD player went down behind the play in this game. After the next whistle, the officials went under the headsets for several minutes to see if a penalty was warranted. On Friday the officials went to the booth to decide Hutton’s penalty, even know everyone in the building knew he was getting 5-and-10. Coach Enrico Blasi asked for a review on UMD’s goal, citing the puck might have gone out of play prior to it going in. The original no-call was upheld. The best is when a goal is scored and there’s a review to see if the play was off-side a minute earlier. You know, because in baseball when someone hits a home run, they go back to see if that ball one call really should’ve been a strike five pitches prior. Give teams two timeouts instead of one. Challenge anything you want. If you’re wrong, you lose a timeout, as it is now. But no other reviews except inside five minutes of the third period and overtime. You hired a second ref for each game, let the officials do their jobs. — It’s too bad the weather kept a large number of fans away on Saturday. The roads were brutal after the game, and many smartly stayed home. The attendance was listed as 2,018 but I suspect that includes season ticket holders who have paid for their seats. Actual attendance was closer to one thousand. A large number at the rink were in town for the whole weekend anyway. I can’t express how much I hate to name drop, especially when it’s someone I’ve never met with a name as prestigious and sensitive as his, but when conditions are poor I’ll always think of that series nine years ago when Brendan Burke was killed. For those not in the know, Burke and his friend died in a car accident on horrible roads northwest of Oxford the day of a Friday game vs. Lake Superior State. Burke, the team manager at the time and son of former NHL general manager Brian Burke, was a pioneer when he came out as openly gay months before the wreck, gaining national attention. That weekend’s weather could’ve claimed any of us who traveled to Oxford for those games. Burke died on a Friday, and the team didn’t find out until later that night, but its members did The Brotherhood proud by scoring seven goals the first 29 minutes of Saturday’s game against a ranked Lakers team in a 10-4 win. Not a team on the planet, including the defending Stanley Cup champion Pittsburgh Penguins, could’ve beaten Miami for that period and a half. — Back to Friday for a second: Blasi was caught yelling at associate coach Peter Mannino on the bench early in the second period. If there’s a disagreement between coaches, that’s something that needs to be handled in private at intermission, especially when a team is struggling as Miami clearly is. LINEUP CHANGES: Andrew Sinard stepped in for Hutton, as the RedHawks are down to seven healthy defensemen. Grant Frederic and Chaz Switzer are both out with lower body injuries. Uhelski got the start for Larkin after the senior’s strong performance in the second half of Friday’s game and stopped 36 of 39 shots in the loss. His save percentage is now .922. Larkin is at .923. Noah Jordan also started up front for the fourth time this season as Carter Johnson was scratched. FORWARDS: D-. An upgrade from ‘F’ on Friday only because they generated better shots and Shepard was outstanding, but seriously, 13 shots and zero goals? DEFENSEMEN: C. Too many shots allowed and this corps did zilch offensively. But with Hutton out, Sinard seemed to thrive with more ice time and Alec Mahalak showcased his defensive talents more with the additional TOI available. GOALTENDING: B+. Uhelski had zero chance on the first and third goals and the other was on a penalty shot. STANDINGS: Miami has fallen to 29th in the PairWise and is in sixth place in the NCHC with a 3-7-2 record. The RedHawks trail fifth-place North Dakota by six points and are seven out of fourth, which is the last home-ice spot for the league tournament. FINAL THOUGHTS: It’s necessary to take a step back and realize that this was always going to be a rebuilding season. After three straight sub-.500 seasons and a 7-2 start, this 0-6-4 skid feels like a Lucy-again-pulling-away-the-football moment, but it’s important to realize that success this season was always going to be a tall order. With six non-seniors and both assistants leaving, the RedHawks pieced this team together in the summer, and still – still – at 9-11-4 have exceeded expectations. It’s just frustrating to see Miami play so well against No. 1 St. Cloud for 120 minutes and then get manhandled by the fifth-ranked team seven weeks later. What we’ve seen in four months of the 2018-19 is a major step ahead in the process toward being an NCAA contending team. But as Minnesota-Duluth showed this weekend, the RedHawks still aren’t there. At least not right now. Fortunately for Miami, there’s still plenty of season left to turn that around. Posted on January 20, 2019, in 2018-19 and tagged 2018-19 miami redhawks, grant hutton, jordan uhelski, josh melnick, ryan larkin. Bookmark the permalink. Leave a comment.